We would like to introduce the King law firm PSD template, which is created by Adobe Photoshop software. 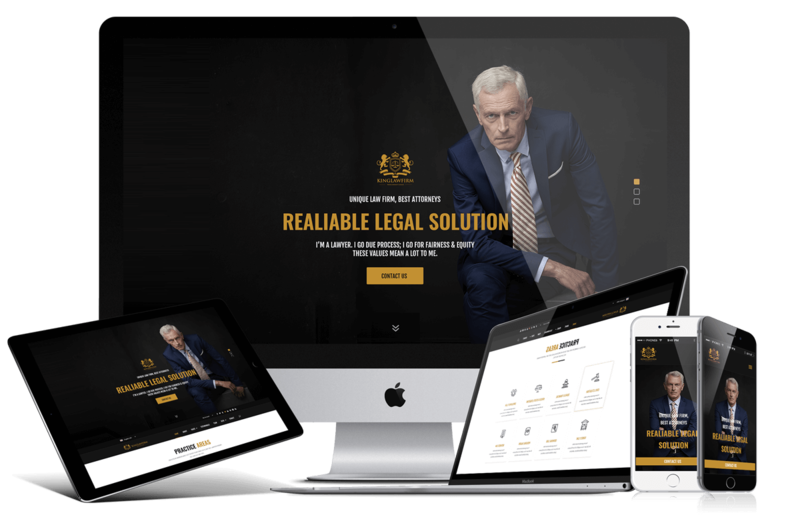 King Law Firm PSD template is created for the customers who are lawyers, attorneys, have Law companies and etc. Our company through a lot which type of a template to create, CMS (WordPress) template or bootstrap (HTML). However, our choice stopped on PSD (photoshop) template because of several reasons. First of all, any kind of a website needs a design and after that can be created bootstrap or any other type of template. Thus, we created a design in PSD and if it comes popular among our customers after that will think about creating HTML bootstrap version or WordPress version. Now, let's discuss King Law Firm PSD template. On the home page, you can create a slideshow. Also added language change section. If you go on the next home page you can see drop down menu, how it looks like(there is no difference it is just to see hows the drop-down menu works). On the home page is a practice area and you can see all the reasons what it is for. Also, this template gives you the ability to give information to the customer how many qualified lawyers do you offer to them; how many cases have your company managed to do. Moreover, there is a section about why should customer trust you. Here you can give every information about your company. The most important part is that there is a comment section where customers write about their impressions. At the end there is a blog, here are how the blog looks like and on the left, there is an article by categories. Also herein blog there is a comment section to get in touch with the author of the specific article. The last page is the Contact page. Here is a Google map location, which can change color, depended on your taste. Most important today is that the website should be responsive, which means that design should be changed depended on in, which devices it is opened by. Therefore, we have created a design for mobile version too which can be see in the live demo preview page. Last but not least, in case if you do not have any experience in photoshop, we offer to our customers our free PSD templates, which can be seen on our free templates section here: https://gridgum.com/themes/category/free/ download it and challenge your gained experience. In the future, we are planning to add more pages to this. If you have any ideas please write us and we will take it into account.